I am the Founder and Executive Director of the Global Lives Project and Research Director at the Institute for the Future. As a cross-disciplinary mediamaker, I enjoy working at the intersection of art, activism and academic inquiry on politically charged questions surrounding globalization and social justice. As terror shook Paris two and a half weeks ago, I was in Brussels, wrapping up the latest leg of my book tour. I was staying less than a mile from Molenbeek, the neighborhood where the attacks on Paris were planned. During my trip, I spent quite a bit of time speaking with educators, and as the trip ended in the midst of such unfortunate circumstances, I started to wonder how education systems may be contributing to shaping a cultural milieu that produces intolerance, war and terrorism. The Global Lives Project is a video library of life experience, built by volunteer collaborators from around the world. Here is a sample of the library on YouTube. In France (as well as the U.S. and many other nations), ethnicity tends to overdetermine education outcomes. In other words, if you correct for the economic background of students and other factors influencing success, ethnic heritage still plays a statistically significant role in determining where a student will fall in the hierarchy, and what their post-graduation employment opportunities will be. Education systems that systematically sort students into winners and losers based on narrow definitions of achievement contribute to an ever-worsening divide between social groups, exacerbated when those lines fall closely along ethnic divides. When ethnic divisions continue to be pronounced in schools, those same types of divides can be reinforced at the geopolitical level. This type of thinking — valuing people of one’s own community above those of another — leads to the unacceptable fact that in our media and our public policy, we in the U.S. have built an unfortunate track record of systematically devaluing the lives of people in Iraq, Afghanistan and elsewhere in the middle east. We see this both in the language of “collateral damage” and also in the fact that we have simply lost count — perhaps by hundreds of thousands — of how many civilian lives have been lost due to the fifteen-year war launched in the wake of 9/11. The Global Lives Project is a nonprofit organization working directly on this issue — building global empathy among the next generation of students to break this cycle of war and terror. Global Lives does this with exhibits in schools showcasing daily life of regular people from all walks of life around the world. 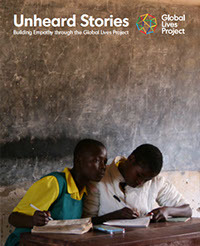 A common-core standards-based curriculum, Unheard Stories (free PDF download) brings this for free to teachers around the world. Global Lives is an example of the kind of educational “moonshot” that I write about in my book, Moonshots in Education, using blended learning to teach non-cognitive skills like empathy. You’ll learn more about Global Lives and the measurable impacts of their work in Part II of this post, but for now, please take a moment this Giving Tuesday and join me in making a donation to the Global Lives Project and bring Global Lives exhibits and curriculum to teachers everywhere.